Regardless of the improvement of accessibility functions, people with visual impairments have problems using touchscreen computers. Though the size of accessible objects may differ for visually impaired users because of the manipulations under screen readers are different from those without screen readers, the characteristics of desired objects and useful gestures on the touchscreen computers for the visually impaired remain unclear. In this paper, our objective is to clarify the accessible single button characteristics and preferable gestures for visually impaired users of touchscreen computers. 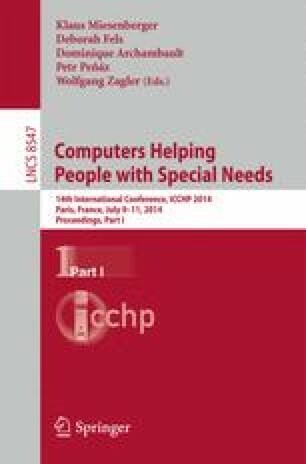 We studied these characteristics by evaluating the single button interaction of touchscreen interfaces for visually impaired people under a screen reader condition. As a result, the performance of task completion time on selecting task with a single button decreased as the button size became larger; they were ranked in descending order of double-tapping after flicking, double-tapping after tracing, and split-tapping after tracing.